Metalium is back with their fifth album, Demons of Insanity – Chapter Five. Yes, we’re a bit late with this review, but at least in my opinion, you haven’t missed anything if you haven’t checked out this CD. 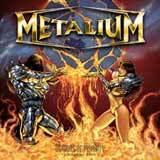 With their first two albums, Metalium had me impressed, to the point that I believed they would be the next “big thing.” However, the quality level slipped with their third album, Hero-Nation. I really wanted to like that album, however, I now know that I was way too generous with that review. The fall continued with As One, and shows no turn around with their latest offering, Demons of Insanity. For me, the sound has more than one critical flaw that takes away any enjoyment I may have salvaged from this album. First of all, where is the bass? Again, there is virtually no bass in the mix on this album. As a result, the overall guitar tone is very thin, and lacks any force whatsoever. Furthermore, the drumming is extremely raw, also sounding far too “snary” for my liking. I’ve heard self financed demos with better drum sound than this. Henning Basse is one of the more talented power metal vocalists, in my opinion. However, like the last album, he devotes too much time trying to wail his lungs out in the high octaves. Also, the thick layering of the vocals is a bit too much, especially when matched up with the obnoxious drum sound and thin guitars. As if that weren’t enough, the narration on this CD is simply laughable. The deep and serious spoken parts come across terribly cheesy and overdramatic. Destiny is one of the few interesting cool songs on this album, yet some horrible narration toward the end of the song nearly kills it for me. For the ultimate laugh, check out Endless Believer. This is an eight minute attempt at an epic, complete with some of the worst narration I’ve ever heard on a metal album. Aside from that, the song itself is uneventful, offering no reason for me to listen to it again. Unfortunately, that’s about par for the course as far as this album is concerned. As for the songwriting, painfully mediocre would be the best way for me to put it. Aside from 3 songs on this album, there is absolutely nothing about the rest of the album that grabs my attention. In all seriousness, most of this album is exactly what waters drown the power metal genre. There are just too many bands out there writing quality material, thus passing Metalium by. The riffs and chorus lines are generic, save for a select few moments. Some scorching solos can be found, and some catchy chorus lines can be heard in Cyber Horizon, Sky Is Falling, and Destiny (the lone 3 memorable tracks of the album. Aside from that, sheer boredom. I’m sorry, but a few nice solos and three worthwhile tracks is not nearly enough to save this album, especially in such a crowded genre as power metal. The end result of this album strikes me as a shame. There really is some talent in this band, but terrible sound quality and ultra boring song writing kills any chance at allowing the listener to hear this. As bands such as Wizard and Gun Barrel have done in the past, I think Metalium would benefit from working with someone like Piet Sielck at some point. I’ve always liked his production, and his involvement always seems to crank up the quality of output for any band that he is involved with. At any rate, Metalium needs to do something, and I am surprised they have survived this long. I know that sounds harsh, but there is just way too much competition in this genre to settle for an album like this.